What is the SEA PTA? 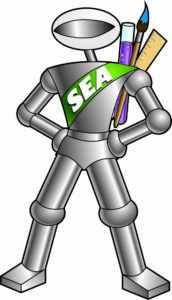 The School of Engineering & Arts Parent Teacher Association (SEA PTA) is a group of parents and staff that are here to support our school through volunteering and fundraising events. The PTA supports a variety of initiatives for the students, teachers, and administrators at SEA. The PTA has monthly meetings, where there is always FREE childcare available! Why join the PTA? So many reasons! Anyone can join! We welcome all parents and guardians of current SEA students. Membership dues are $10 per school year. Scholarships are available.